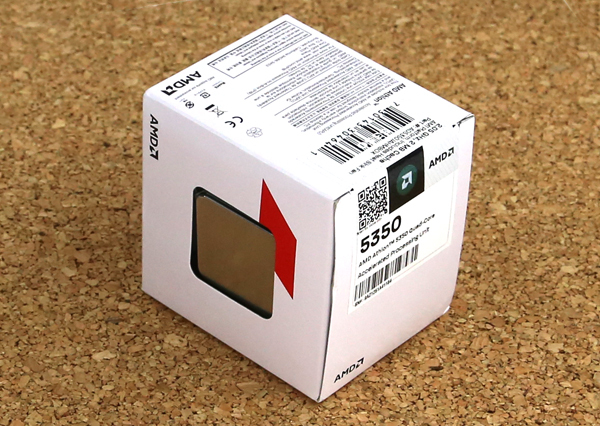 Later this week, AMD will launch its socket AM1/ FS1b based Kabini SoC’s, the fastest of which will be the Athlon 5350. The AMD Athlon 5350 will be the fastest 25w TDP socket AM1 processor at launch. It has four “Jaguar” cores running at 2.05GHz. The other side of the chip is its 128 core Graphics Core Next (GCN) cores running at 600MHz which AMD markets as a Radeon R3. We are not going to test the GPU today since we typically focus on CPU benchmarks with our Linux test suite. Still, we are very excited to see what these new Kabini APU’s can do. Today we are using our standard Linux benchmarking suite to get an idea about the AMD Athlon 5350 quad core processor performance. As a direct result of user feedback, we recently had the benchmarks all put into a single script that you can use to benchmark your own systems. As development has progressed on the next version we have moved the current script to STHbench 2013 – Download and Instructions as a resource on the forums. That guide has three simple commands that you can use with a stock installation to run our test suite and install/ compile all necessary files. No configuration is needed. For the next generation development version which currently can also run on CentOS and Mint, and expands the suite to include sysbench and redis-benchmark results, look here: (see Introducing the STHbench.sh Server Benchmarking Script). We do sort on UnixBench multi-threaded Dhrystone results. Generally hardinfo gives us a quick preview of the rest of the suite. For those wondering why we have dual processor results in here, consider this. 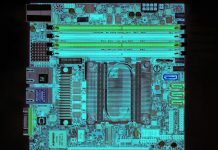 A complete dual Xeon L5530 or AMD Opteron 2419 EE server can be purchased used, with RAM for about the same price as an AMD Athlon 5350 system. Likewise, Xeon L5520 pricing is under $25 per chip on ebay. We ended up spending more than $50 for the Athlon 5350 however that was pre-release retail pricing. Of course, all of these dual processor configurations are going to use more power but interesting nonetheless. One thing we can see here is that the AMD Athlon 5350 is very competitive with the Intel Silvermont based offerings, and appears to be significantly faster than the lower-cost Intel Celeron 1007U platform we saw earlier. For a quick recap, the Celeron J1900 and Atom C2550 are quad core Silvermont architectures while the Atom C2750 and C2758 are 8-core variants. 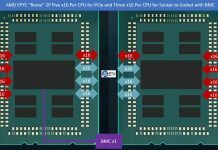 One can clearly see the AMD SoC is very competitive with Intel’s offerings released last fall in terms of CPU performance. 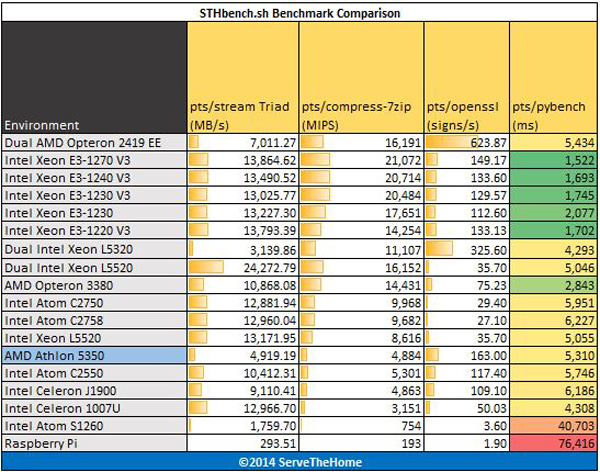 The Xeon E3-1200 chips are all significantly faster, but are also more costly. They also serve as a solid proxy for desktop chips. 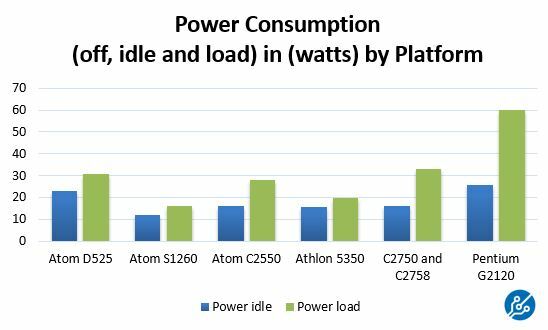 In terms of single-threaded performance, the AMD Athlon 5350 stacks up just behind the Intel Silvermont based Atom and Celerons. One can see that even the low power/ clocked and over 5 year old Nehalem L5520 chips are still significantly faster in most single threaded benchmarks. Moving to the multi-threaded side, we actually see that the AMD Athlon 5350 performs well against the quad core Silvermont parts. One other major takeaway from these charts is that low-power performance is slower than current generation desktop parts. However looking at a Haswell based Xeon E3-1270 V3 versus an AMD Athlon 350 there is less than a 4x differential in Dhrystone performance. On the other hand SoC’s like the Raspberry Pi and older Atom S1260 parts are generally about 1/10th the performance of the current crop of low-power processors. 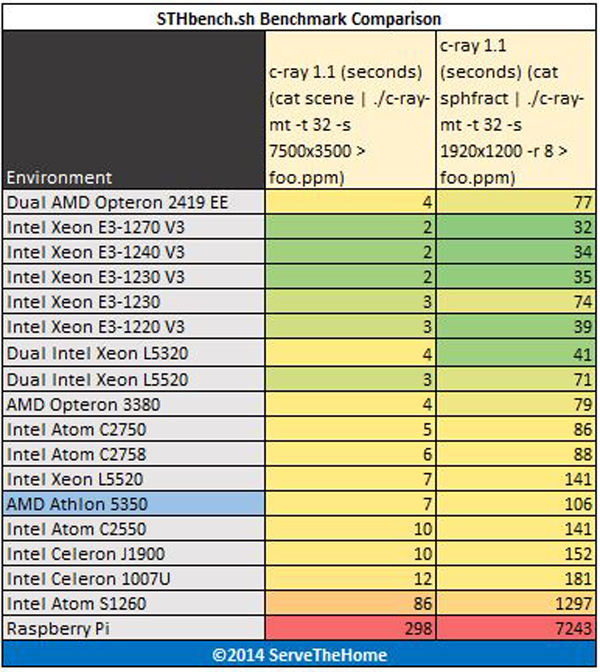 Here we see the AMD Athlon 5350 perform significantly better than the quad core Silvermont parts. 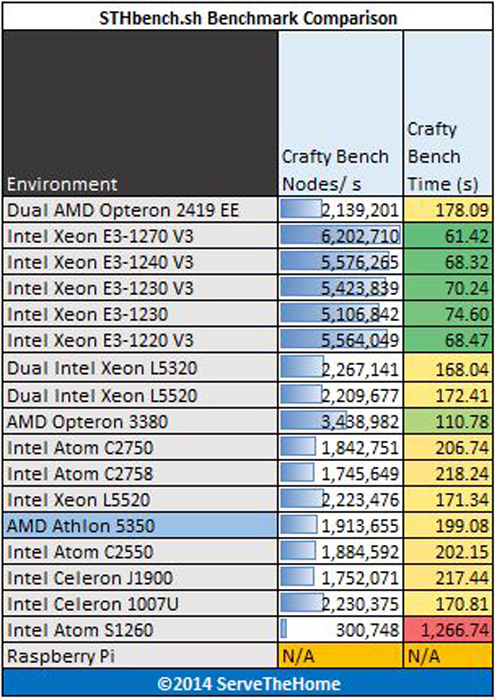 The Athlon 5350 is even competitive with a single Intel Xeon L5520 here. 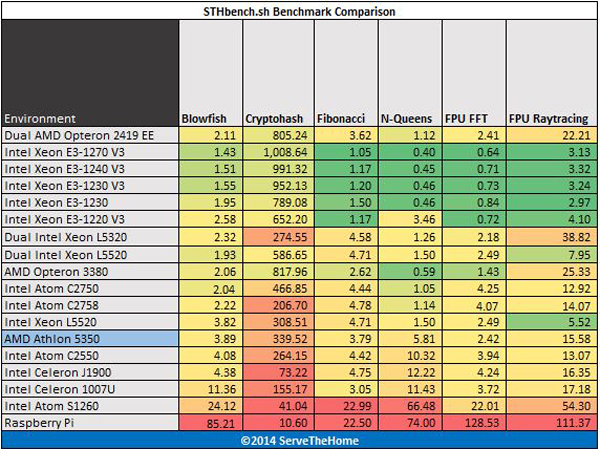 The 8-core Silvermont processors are faster. Here we can see a significant flaw in the AMD Athlon 5350 design, memory bandwidth. The AMD Athlon 5350 is a single channel DDR3 design. Even with 1600MHz DDR3 memory, the bandwidth provided to the CPU is anemic. With two DIMM slots on the motherboard, one does wonder why AMD would not just go for a dual channel memory controller. Here we again reinforce the trend that the AMD Athlon 5350 has single threaded performance close to that of Silvermont architecture processors. The bottom line here is that the entire platform runs very cool. We use 22C to 60C as our lower to upper bounds due to the fact that we test many dual processor setups. One can see the platform runs very cool. Overall, the AMD AM1 platform is fairly compelling. With a FS1b socket, there are a variety of options for different processors and a potential upgrade path. 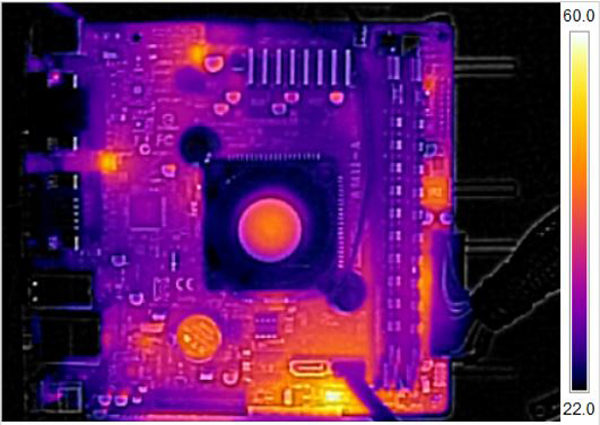 From our Linux benchmarking, we can see that the platform is highly competitive with the Intel Silvermont based Atom C2000 series and Bay Trail-D in terms of raw processor performance. Kabini delivers in that respect. Frankly, memory bandwidth is bad. 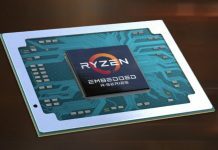 I am interested to see how the AMD R3 graphics perform with very little main memory bandwidth. Given what we saw today, the $5-10 upgrade price versus the AMD Athlon 5150 is going to be an obvious one. The bigger question is whether it is worth it to upgrade to a quad core model versus dual core models. We do have two Sempron dual core models en-route to test so that answer should be coming shortly. Can you do a pfsense build article with this setup? Maybe try ecc ram and Intel NICs on it?